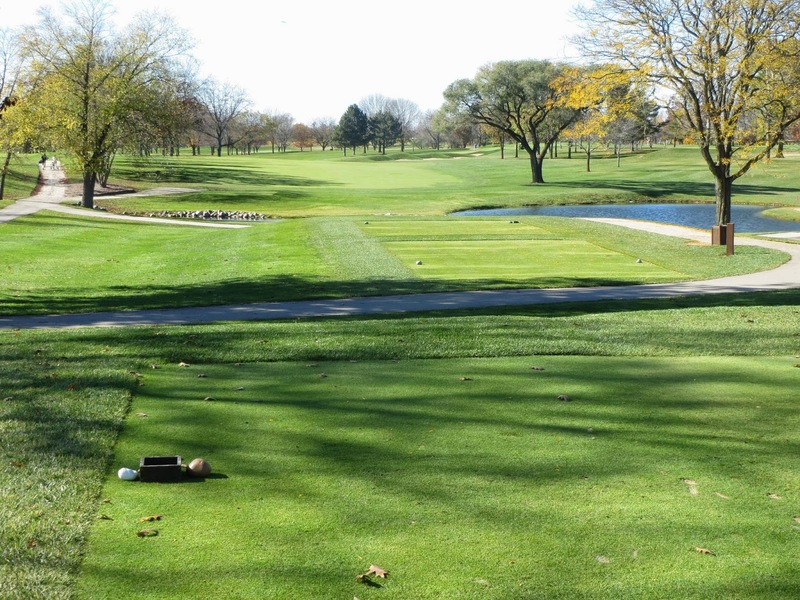 Ever since I was a kid growing up in Hartland, I always wanted to play Westmoor Country Club. 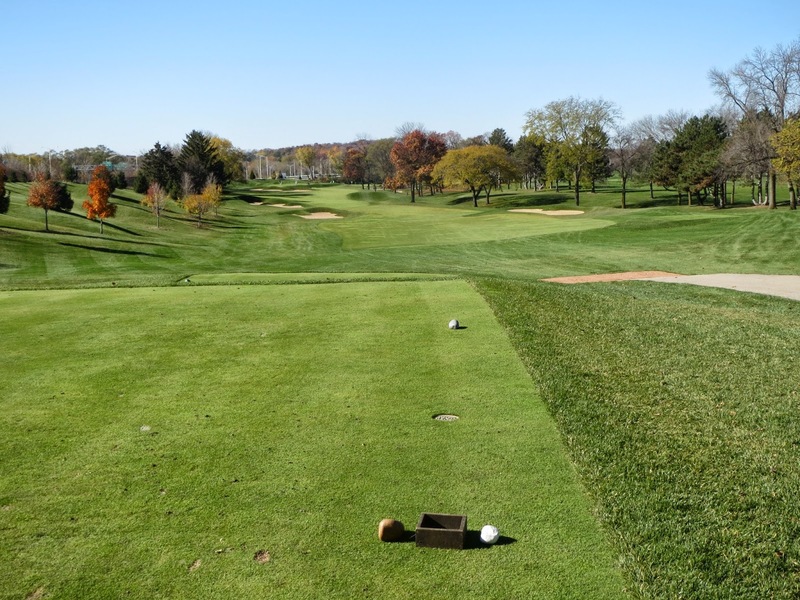 I passed by it every time I went to Brookfield Square or Milwaukee, and the view up the par three fifth and down the fairway of the adjacent fourth always whet my appetite to see what this course had to offer. 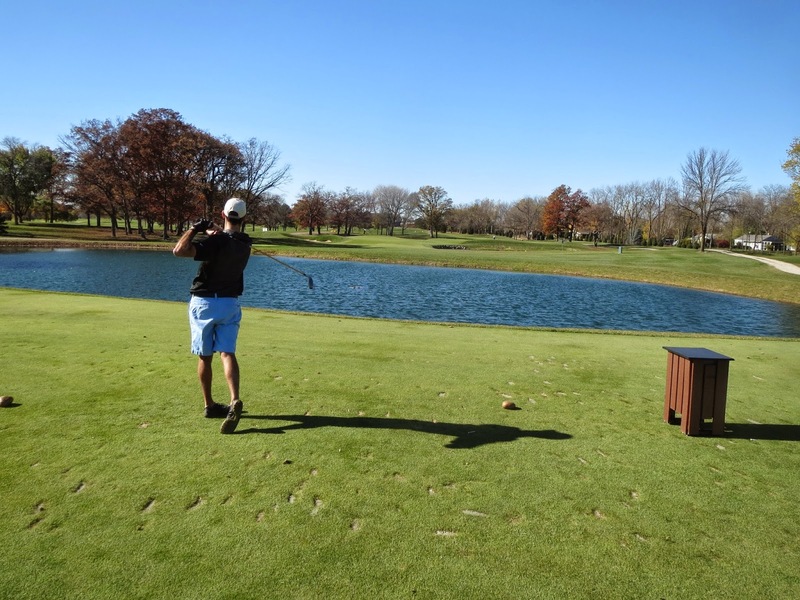 This past October, I got the chance to check it out as my friend, Joey, who is a member at Westmoor, was hosting his annual Chop Stix Open. The event, coinciding with his birthday, was a great time and we couldn’t have been more fortunate weather-wise – I am told they played in 30-degree temperatures and tons of wind last year. 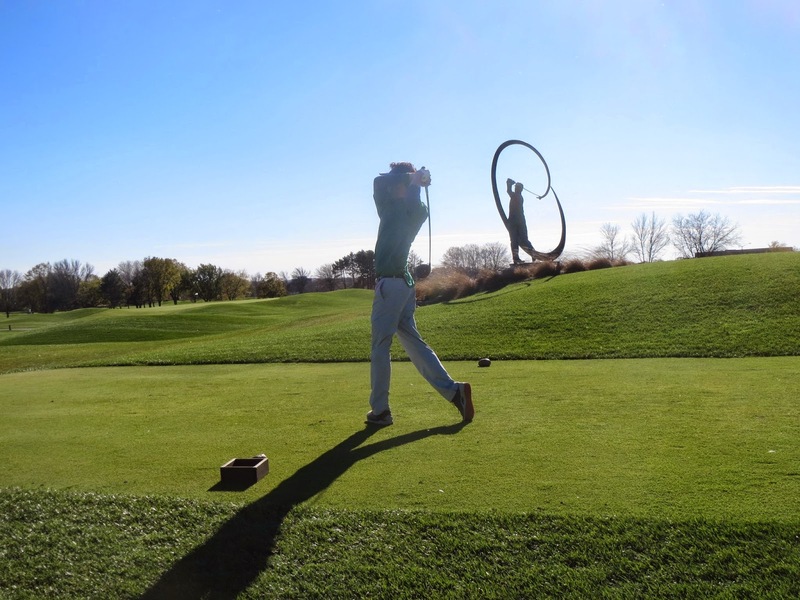 The wind was certainly a factor this year, too, at times well over 25 miles per hour, but the temperatures were in the 50’s, the sun was out and it felt great to swing the sticks in Wisconsin in late October. The Chop Stix Open event is a two-man best ball competition with [mostly] players of Asian descent versus us regular white guys, and while the white guys won, I am told the Asian team won handily in the drinking and fun department. I have to admit I had plenty of fun, though, myself. 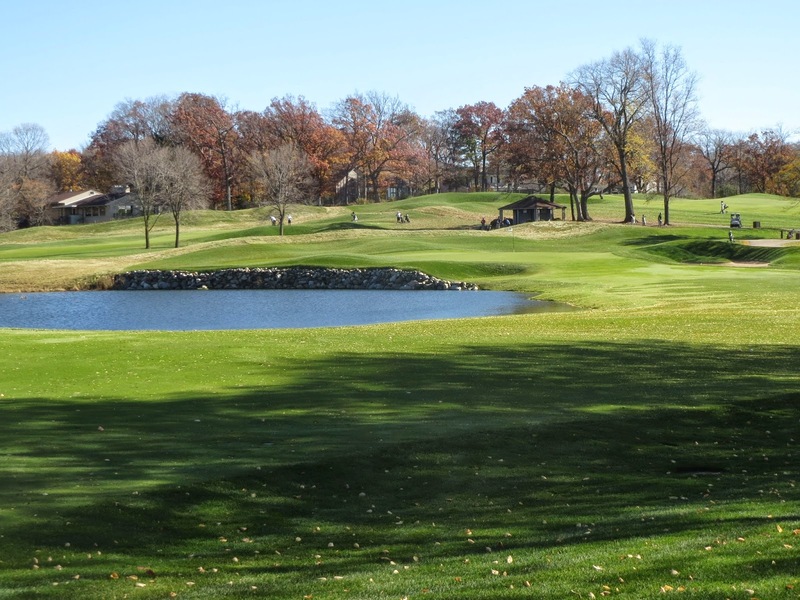 Westmoor is a fabulous golf club, with a large pool and clubhouse, tennis courts, and a massive men’s locker room [with its own cards/bar/game room] that dwarfs the one I am used to at North Hills (it is also a very expensive club with what I have heard is a significant down-stroke). The course is very impressive. What was once considered to be a perhaps overly tight parkland track was opened up and lengthened in 2009 by Lohmann Golf Design – the critiques I have heard have gotten mixed reviews, with some saying the renovation got rid of some of its character, while others love the new-age look and feel of the traps and mounding. 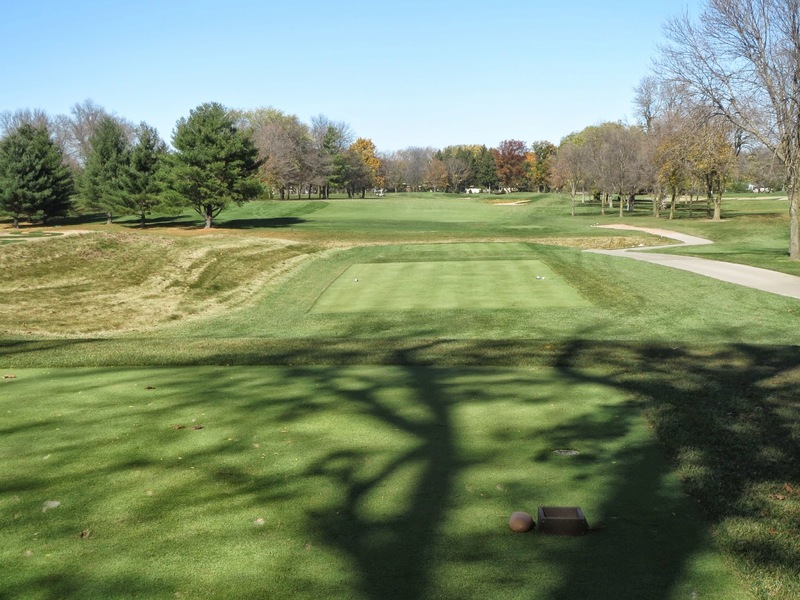 Westmoor originally opened in 1926 as a 27-hole facility designed by one of its members, Lloyd Fitzgerald. 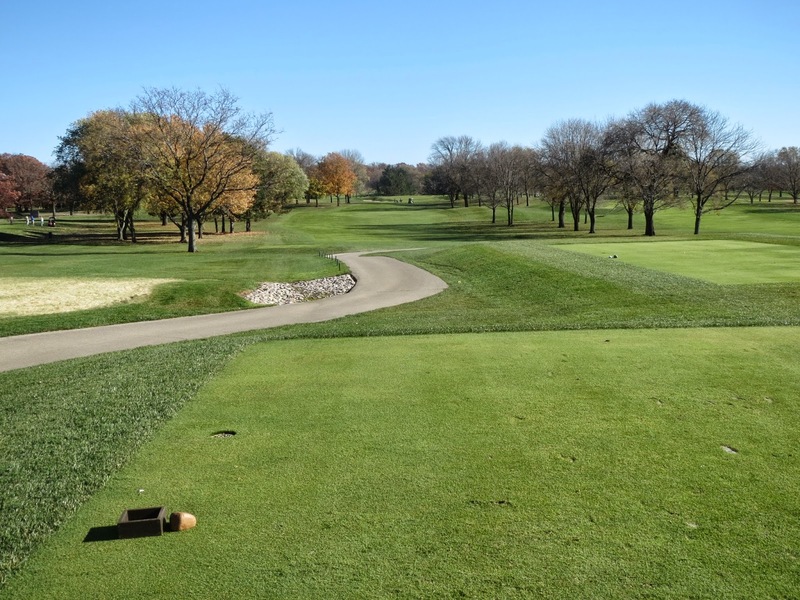 In the 1950’s, Interstate 94 was expanded and the legendary William Langford was brought in to redesign the fourth through eighth holes that were wiped out by construction of the freeway (courtesy of Westmoor’s Assistant Superintendent, Bryan Bergner, via GolfClubAtlas). 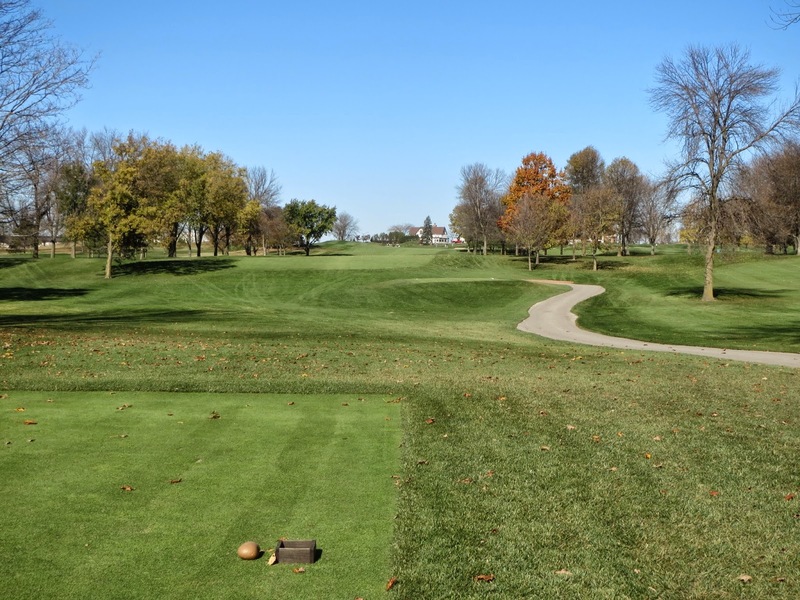 You will notice in my commentary below that my opinions are very much in line with Bergner’s: The fourth through eighth holes are the strongest, most beautiful and strategic ones on the course. 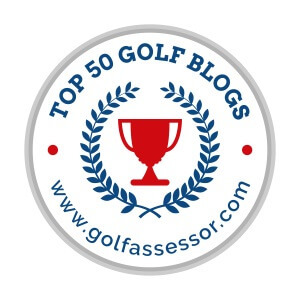 Simply stated, they are outstanding golf holes. 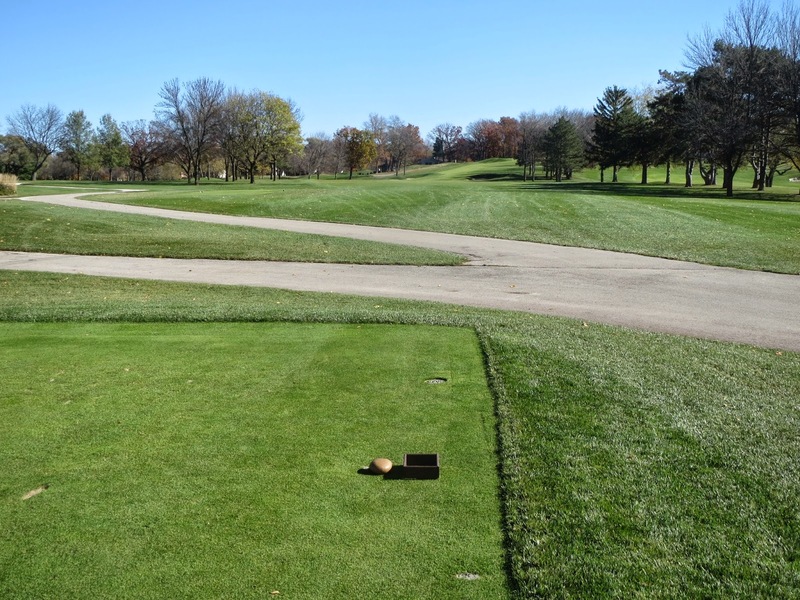 In 1973, renovation work was done to holes one and ten, and on fifteen through eighteen by David Gill, and the course was then merely tinkered with until the large-scale renovation of 2008/2009. 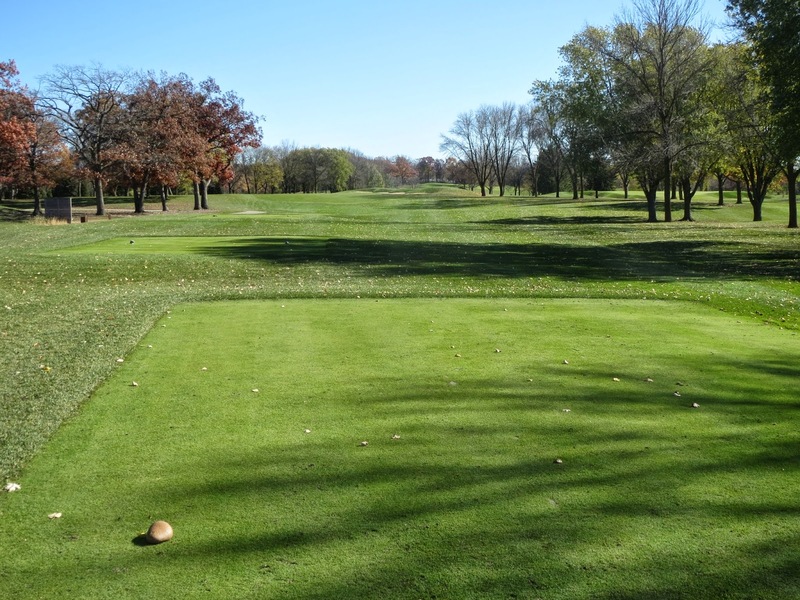 Lohmann’s redesign was intended to unify the course in to a more Langford-like track with elevated, plateaued greens alike those played on Lawsonia’s Links course (designed by Langford and Theodore Moreau) and at nearby West Bend Country Club. While I never played Westmoor prior to this year, I do think the majority of the course is consistently themed rather well, but most importantly that it is entirely aesthetically pleasing and an excellent challenge of golf. 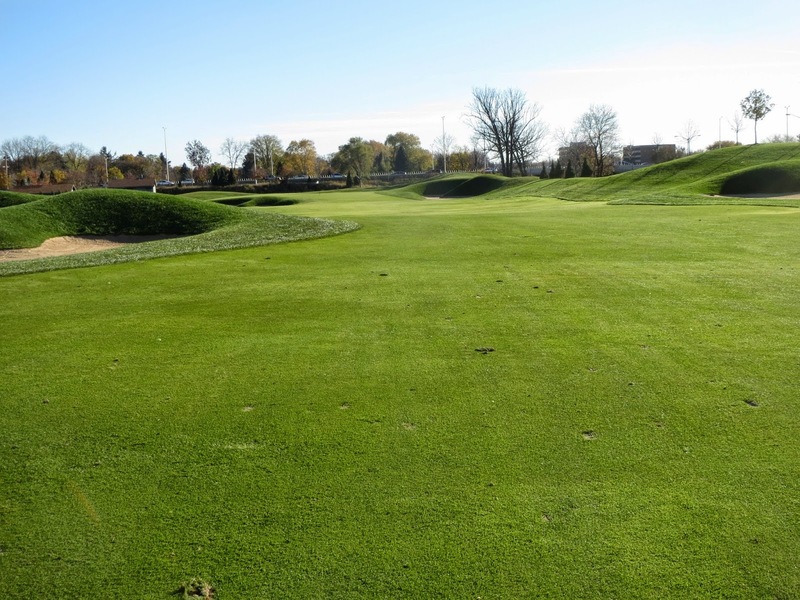 The openness of the renovated course allows for the wind to affect play significantly, while allowing for slightly off-struck longer shots to result in less penalty. 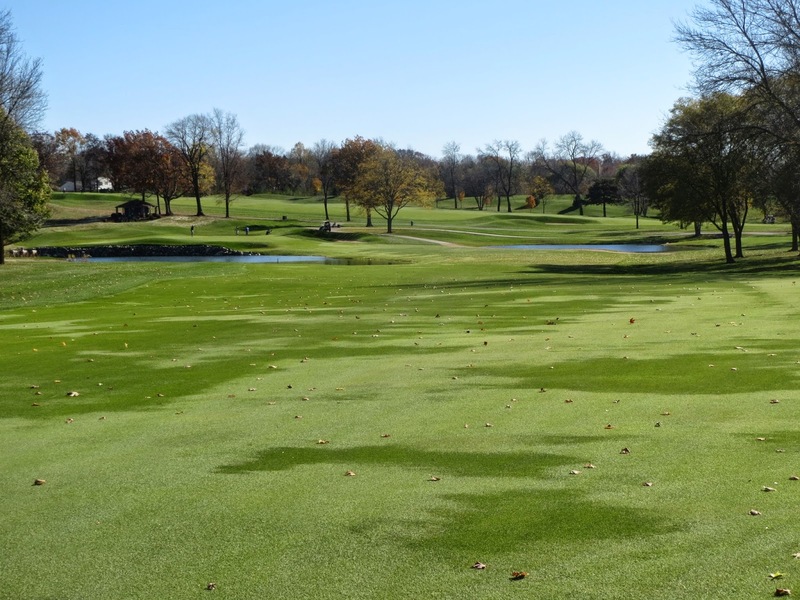 Sans the water hazards and nearby road traffic, there are few unplayable areas at Westmoor. 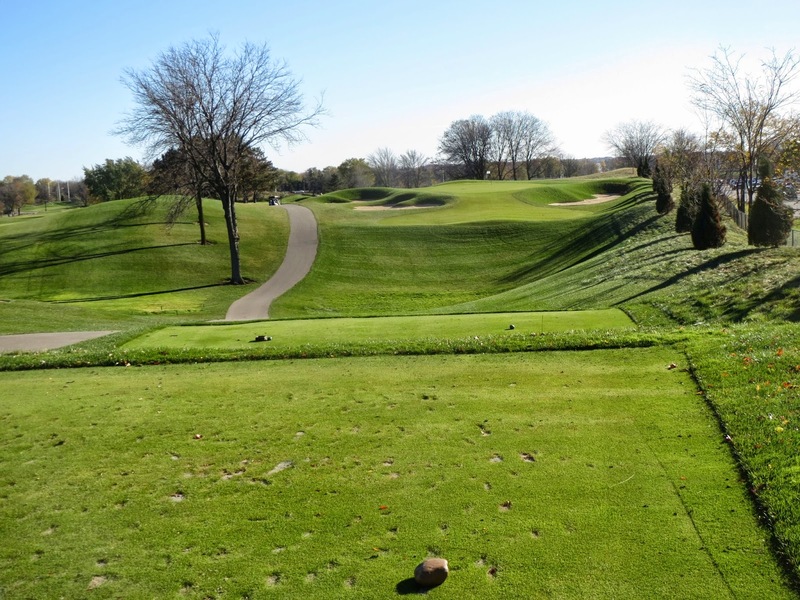 I also really enjoyed the variety of par fours, with some as short from the first tees in as the 339-yard tenth (356 from the tips) and [the reachable] 346-yard sixth (378 from the tips), and as long as the beastly 442-yard second hole (467 from the tips) that played directly in to the teeth of the wind. Equally as varied are their par threes, which range from 154 to 220 from the tips, and from 146 to 180 from the first tees in (copper tees). The par threes have great character, especially the fifth which plays over a pond and significantly uphill from 180 (217 from the tips). This is the par three seen from I-94. 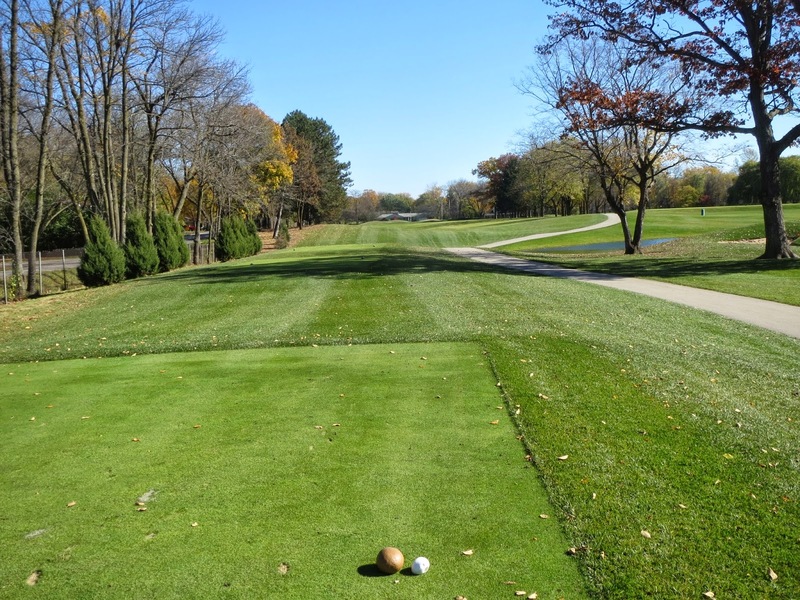 Westmoor begins with a fairly straightforward par four of 399 yards. A good tee shot down the middle should leave in a simple approach to a large green that slopes from back to front to help hold irons. The second hole at Westmoor is not quite as straightforward. Well over 400 yards, and playing back toward the clubhouse, two is a bitterly long hole that played straight in to a severe wind. I hit maybe my best drive of the day on this hole, then a solid three-wood, only to be 20 yards short. I then, feeling like a world beater, shaved under a wedge, ran the ball two-thirds of the way up this steeply sloped green and two-putted for double. Playing from 146 yards from the copper tees, the shot is uphill to an elevated green with deep sand traps surrounding the putting surface. The back of the green falls off long and left, so distance control is key. Four is a beautiful par four – maybe my favorite on the entire course, in fact. Continuing alongside Moorland Road, the traps that adjoin the fairway and rough are obviously best to avoid, but are playable. The berms are steep, and more bunkers encroach the green complex. A slight ridge runs through the front-left of the green, which was the difference between Mike and I beating Ross and his playing partner, or tying. I read it opposite and Ross read it correctly – our match, which started on five, finished all square. My favorite par three on the course, five is a long, uphill one-shotter over water that requires one to two extra clubs. 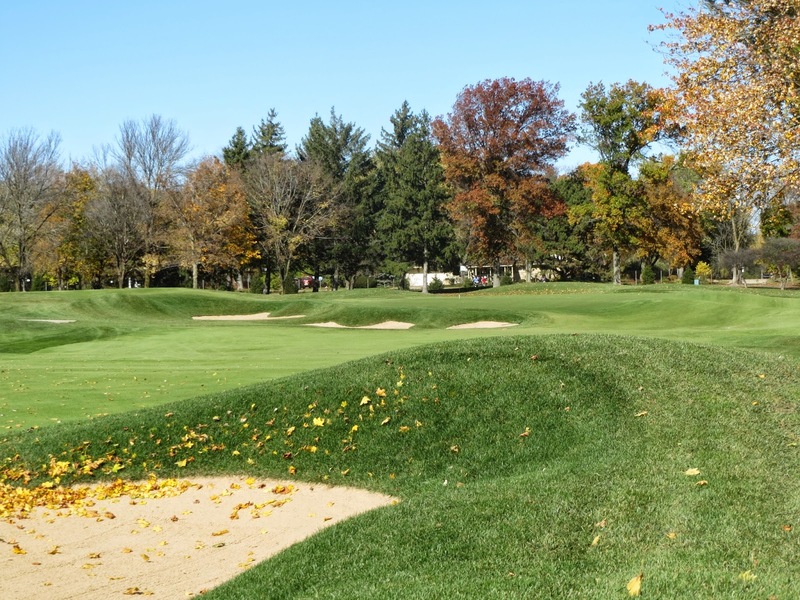 The green-side bunkers are deep, but the green is large and forgiving beyond its false front. 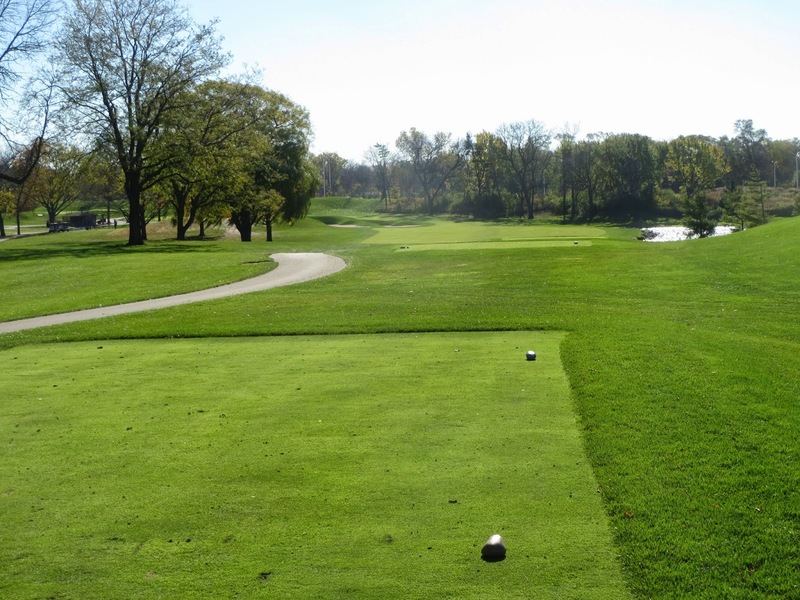 The shortest of the par fours on the course as the bird flies, six can be attacked by long hitters with a draw over the left-side trees and bunkers. From 346 yards (copper tees), Ross actually hit it from the tee with a high draw for the day’s first birdie. 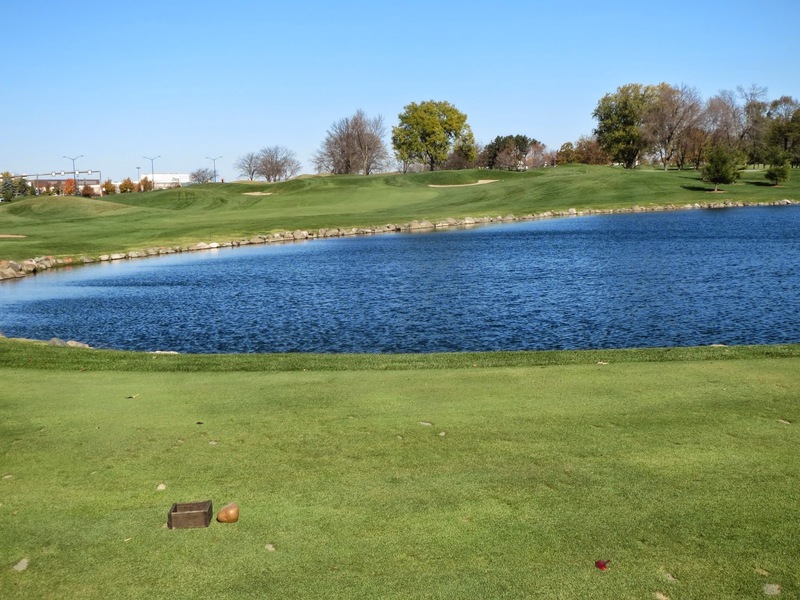 The pond on the right side, which is flown on the previous par three, is in play but there is open grass on the long side of it for big hitters. Seven is a long par four, all uphill. At 429 yards from the first tees in, the first objective is to avoid the traps both on the left and right side of the driving area. 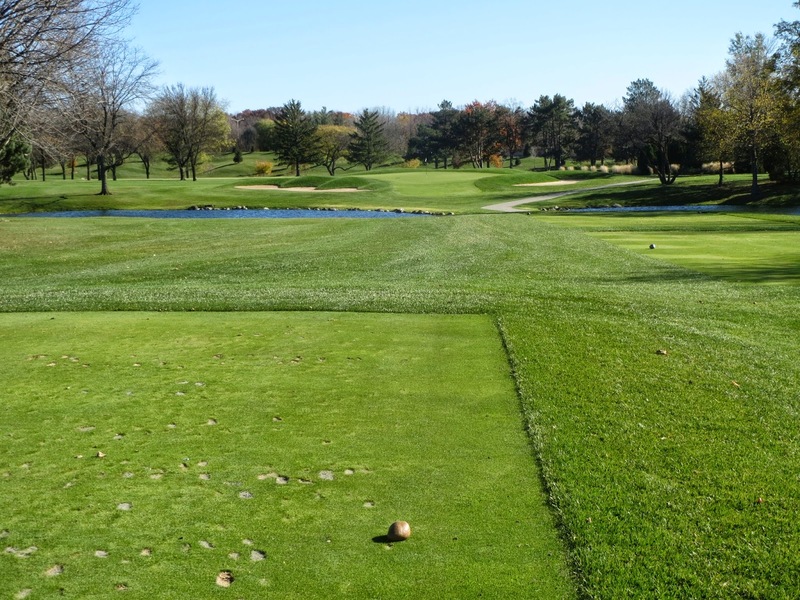 From there, a long iron or fairway metal can be hit uphill to a green that slopes from back to front. Eight is a great hole, with the shortest distance of any of the par fives on the course. 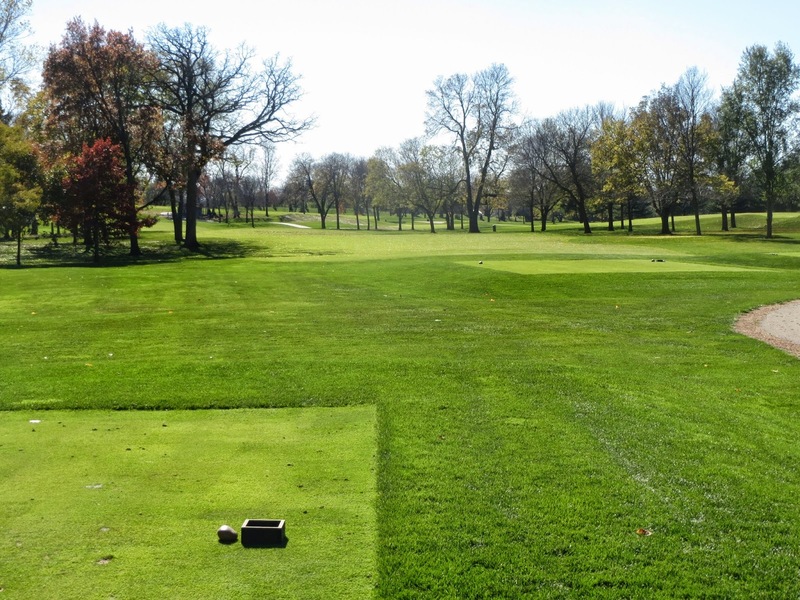 Carrying the traps on the left side of the fairway is a task, but can be done. The smarter play, of course, is to hit to the fairway and lay up on the second shot. The approach area is literally smattered with fairway and green-side bunkers that have to be flown to hit this green in two. The green is elevated and heavily contoured. Finishing the front nine is the longest hole on the course, a 575-yard monster of a par five that plays uphill to an elevated green before the clubhouse. This is a true three-shot par five. 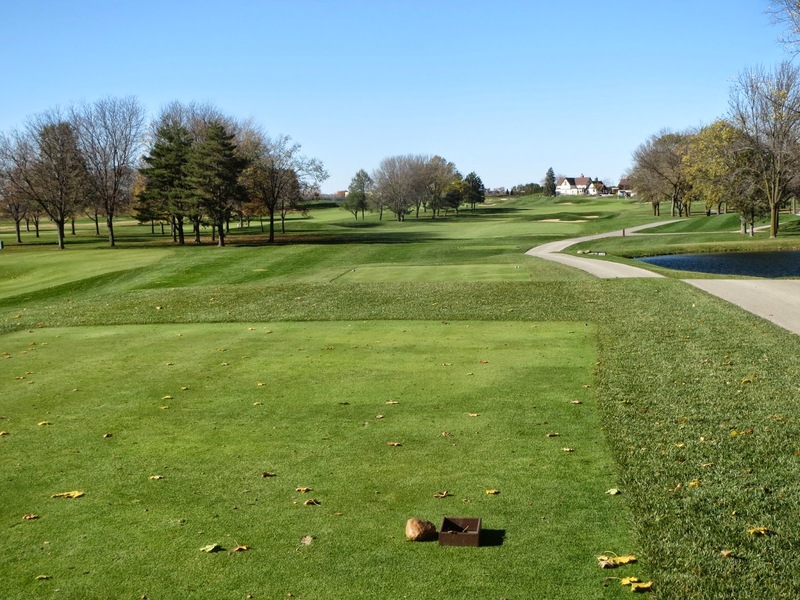 Ten at Westmoor actually reminds me a little of the opening hole at North Hills Country Club, which is a short par four with a treeline running the length of the left side of the tee boxes, and a fairway that veers softly in that direction. What we did not expect was the water feature beyond the right-side treeline just before the green. Three of us hit this pond, which was an un-welcomed surprise to say the least. Thankfully, I was the one who did not hit it and ended up winning the hole easily. 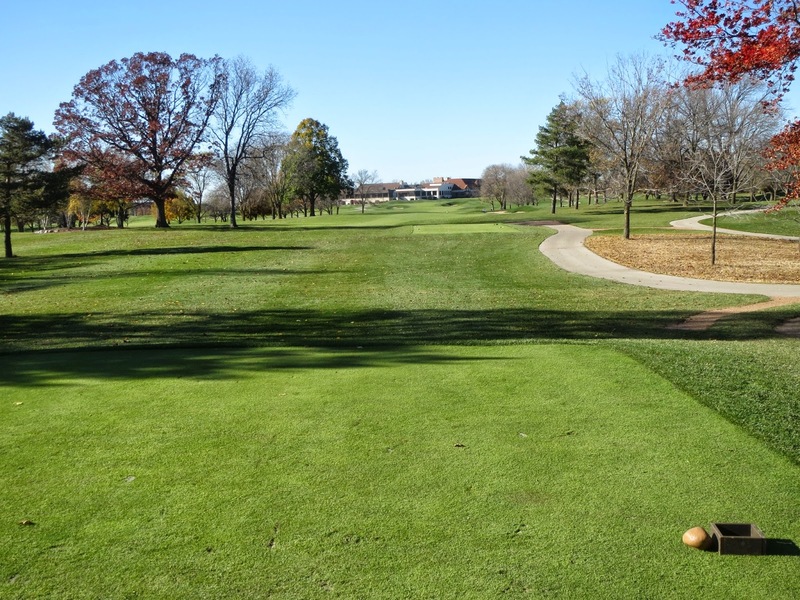 With out-of-bounds left, and a treeline right, the eleventh plays straightforward until the green complex. The green is very heavily sloped from back to front, before plateauing and falling off in back. Twelve was a great hole for us during our round, with the wind directly at our backs. This hole was bombs-away at its best [with a draw], as exemplified by Ross who was 100 yards out off the tee (325-plus yard drive). This elevated green had what was probably the trickiest pin placement of the day: All the way back on a shelf that was nearly impossible to get near. Thirteen is another good driving hole with a really difficult green. 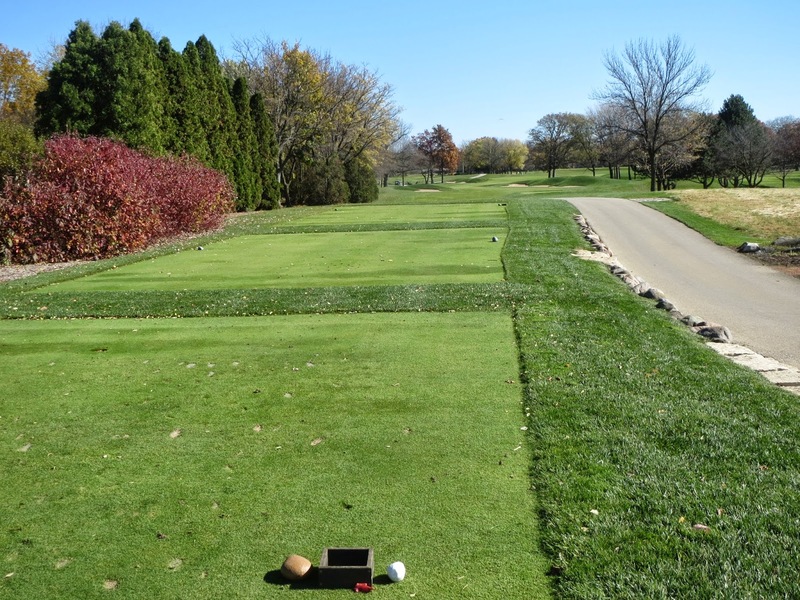 The traps on the right are the only real obstacle off the tee, while a solid drive will bound the ball forward charitably. The green complex lies on the opposite side of some deep traps, though, and leans heavily from back-left to front-right. 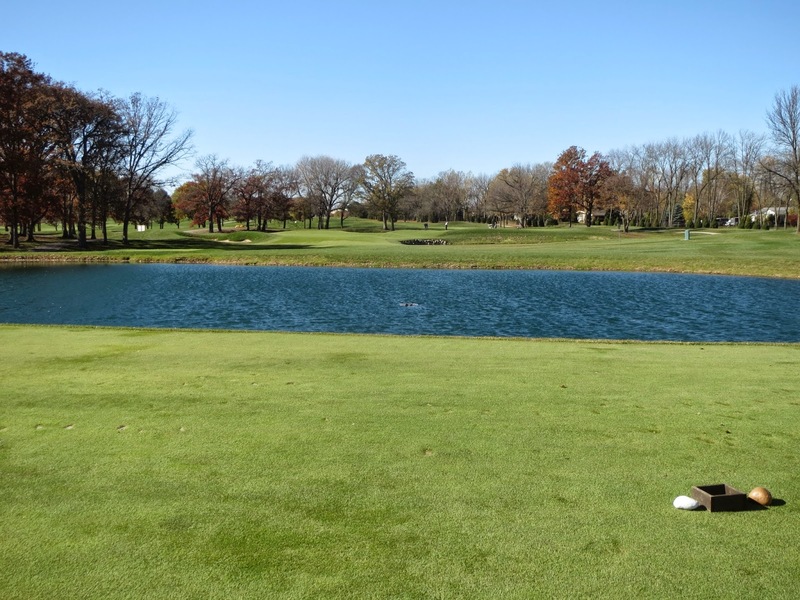 Although only 167 yards from the copper tees, fourteen was by far the hardest of the par threes at Westmoor during our round. The wind was absolutely howling in and to the right of us, bringing the pond front-right of the green well in to play. Our group had some long hitters in it, especially Ross who usually hits a five-iron well over 200 yards. On this day, though, a 200-yard shot was nowhere near enough to reach, as he fell short and right in to the water. Learning from the others, I hit a perfectly struck three-hybrid (my 225-yard club) right in to the teeth of the wind, watched it climb higher and higher, then submerge itself completely in the green about six feet short of the pin. It was my shot of the day. Even though I missed the birdie putt, I tapped in for par and beat the field by a stroke. Fifteen is a tough par five, with a mostly blind tee shot to a fairway that falls sharply to the right near the targeted driving zone. From there, the fairway goes downhill and the approach area is over a lot of water, which is never an easy task with an almost inevitably downhill lie. This is a great hole to play it safe on. Another really great looking par four at Westmoor is the sixteenth. 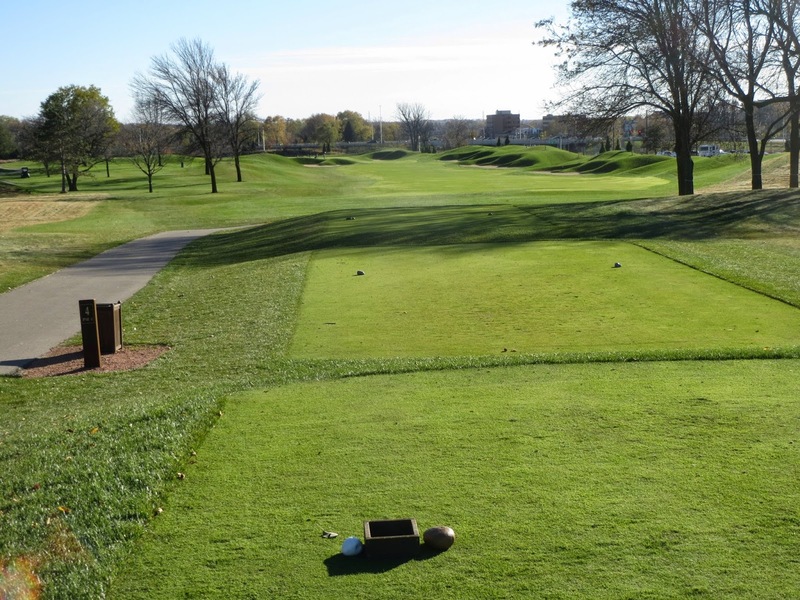 Favor the left side of the fairway to stay out of the traps on the right at all costs. Take it from me, they are not fun to be in especially with a downward lie. The fairway runs heavily to the right, but the sand found on that side of the fairway is a long way to fly and should be kept away from. With the wind at our backs, the 173-yard par three seventeenth was anything but a short par three. I led the group off with a nine-iron that looked like it almost hit the flag, for example, only to be 40 feet above the hole. The false front here means flying the green is a necessity, but the heavy slope from back to front will help hold irons. I love a good challenging eighteenth hole, and Westmoor has a doozy. 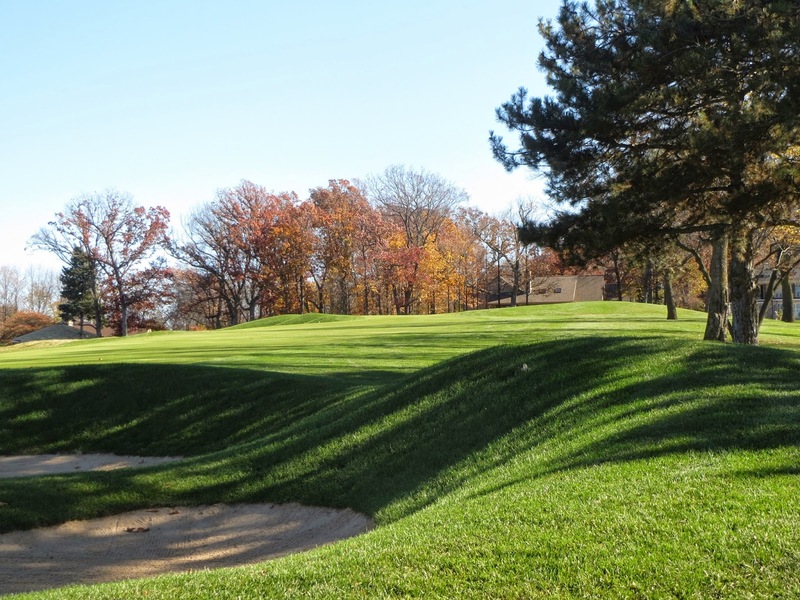 At 417 yards from the copper tees, and 469 from the tips, the eighteenth plays sharply uphill and has a multitude of fairway traps to avoid during the climb. Playing back toward the clubhouse, I am sure the next time I play Westmoor I will have one thing on my mind during this trek: I cannot wait to get a huge order of french fries. Westmoor is well known in the Milwaukee area for providing the best culinary experience, and you will get a good taste of this from the fries alone – prepared in duck fat and seasoned with parmesan cheese, they are absolutely amazing. Although my round here was on a mostly leafless late October, I really enjoyed the golfing experience at Westmoor Country Club, and cannot wait to hopefully get back again next year to re-shoot it when the weather is warm and the course’s conditions are tip-top (the conditions for late October, though, were absolutely spectacular, especially the fairways!). 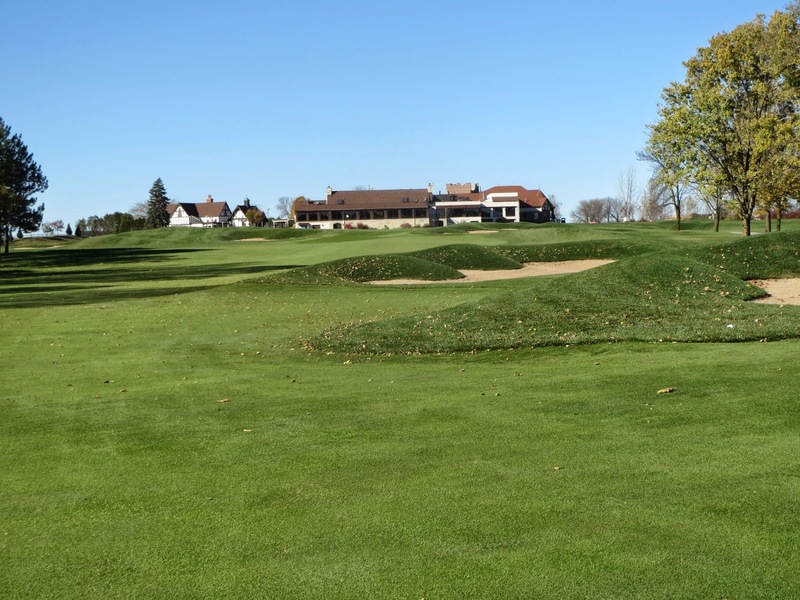 While Westmoor is a private club, the public does have a number of opportunities to play it, usually on Mondays for charitable golf events like the Milwaukee Bucks outing to benefit cystic fibrosis (which was held on September 22 this year). If you have the opportunity to take time off from work, and $2,500 for a foursome, I highly recommend playing it.